The videos in this program sample movies or use sci-fi tropes to present alternate histories that address issues around rights, identities, displacement, and conflict. 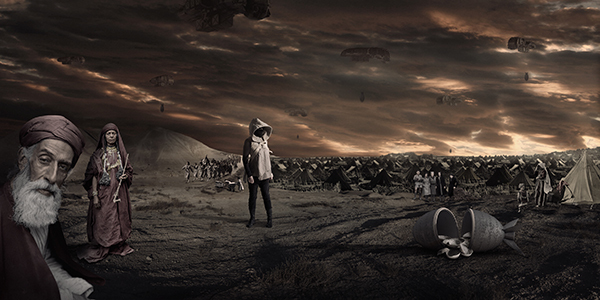 In A Space Exodus, Larissa Sansour (Denmark’s representative at the next Venice Biennale) becomes the first Palestinian on the moon, trying from space to re-establish communication with Jerusalem. Nation Estate, her Swiftian response to Middle East deadlock, offers a vertical solution to Palestinian statehood.